When I could eat eggs, I appreciated all their qualities and the many, many things they were useful for in my diet. I would have eggs for breakfast, lunch or dinner – omelets, poached with toast, scrambled with veggies, quiches, frittatas, over-easy or my ultimate favorite…the egg and cheese sandwich with or without bacon and tomato. I also used it when cooking or baking, of course. When I became allergic to eggs in 2010, it was heartbreaking. I felt like I had nothing to eat for breakfast and I was very sad that I could not make cookies or cakes anymore. Eggs are in EVERYTHING, especially many gluten free foods! Sounds like a nightmare, right? Well, I am fortunate that I stumbled upon a cookbook written by baking genius, Erin McKenna. She owns Babycakes in New York City that now has locations in other cities like Los Angeles, CA and Orlando, FL. Her bakery is gluten free and vegan, as well as soy free. She introduced me to baking things without eggs – and all her recipes tasted so amazing! You would not even know that the eggs were gone. I can’t have my eggs for breakfast anymore, but I can make lots of other things instead. We will talk breakfast ideas in greater detail very soon! So don’t worry egg free readers, it will be okay. And food will still taste good. Eggs are used for a variety of things in cooking and baking; they can be binders, add moisture, or provide leavening to a recipe. You can use pureed fruits, chia, flax meal, pre-made egg replacers, and tofu to substitute for eggs. I mix 1 Tbsp. 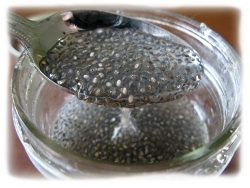 of chia seeds with 3 Tbsp. of warm water. You can double or triple the ratio as needed. Give it a stir and let sit for a minute or two. Then give it another stir and let stand for another minute or two. It will start to thicken and form a gel that works well as an egg replacer. I have used it to replace 2 eggs in several recipes with good success. There is a picture of the seeds on the left next to a chia egg. 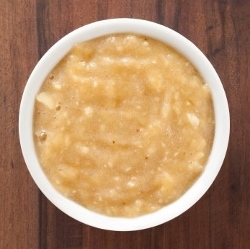 Unsweetened applesauce or mashed bananas can be used as egg replacer in some recipes. I often use applesauce when baking (Musselman’s organic, unsweetened applesauce is my favorite) because it will replace an egg and also add some sweetness so I can reduce the sugar. Besides, it keeps well in the closet and ripeness doesn’t matter! I use 1/3 cup of applesauce to replace each egg, but some people have success with ¼ cup instead. If you replace more than one egg, it may alter the consistency of your recipe depending on what you are cooking. For example, it works great in cookies, brownies, and biscuits to replace the 1 egg needed. I tried making a cake that called for 2 eggs and it came out on the mushier side. 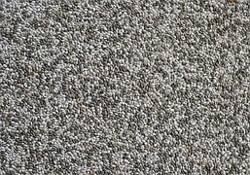 Mix ¼ cup of water in a small cup or bowl with 1 tsp of flax meal. Stir it and then let it stand for a few minutes while it thickens and the water is absorbed. It will thicken. Then you can use this mixture to replace 1 egg in a recipe. Feel free to double the recipe for replacing 2 eggs. These egg replacers are available at specialty stores and many grocery stores now in the baking aisle. They can be used to replace more eggs in recipes than the ‘made at home’ replacers listed above. They are usually flavorless and work well. I personally have not used them much because I have applesauce and flax meal on hand all the time and it saves me money to use what I already purchased. But, if I need it for a special recipe, it is a great alternative option.